Daniela Krtsch, a German artist working in Lisbon, Portugal, is known mainly for her oil paintings. She touches on themes such as home, culture, and identity. 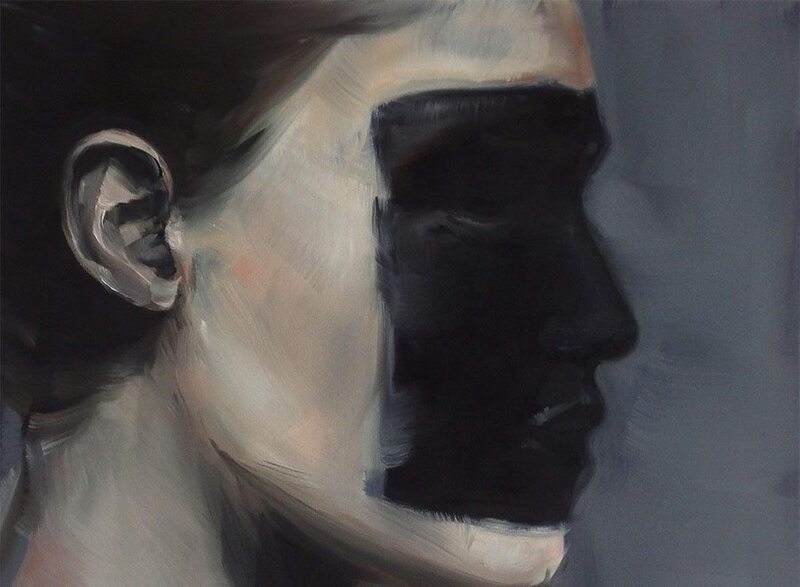 But this piece strays from these motifs, as it features the profile of a young woman whose face is covered in black paint as if disconnecting from her identity entirely. Most portraits hinge on the details of the face, but Krtsch’s piece turns this trope on its head. Our eyes are immediately drawn to the piece of the woman that is missing. The face is usually vital to understand or recognize a person. But here, there are only the outlines of her features, the woman’s eyes and mouth shut and blacked out. The details of the woman’s face are still present, but her expression remains just as blank as her blackened features. Krtsch utilizes cold colors, incorporating grays and whites into her skin, making the woman appear more like a corpse than a human. A picture is often worth a thousand words, but Krtsch’s painting raises a thousand questions. Who is this woman with no face, no emotion, and no identity? Another question remains of why the woman’s face is blacked out in the first place. Did she choose to obscure her face or did someone do it for her? Perhaps she is hiding herself, feeling shame, feeling anxiety and sadness, suffering from her own emptiness and feeling this lack of identity to her core. Does this woman perceive herself as faceless, lifeless, or insignificant? Krtsch could be making a statement on the way that our own insecurities can consume us, can distort our outlook and blur the line between our thoughts and reality. It is often easy to feel invisible or ugly, to want to hide. People often feel unidentifiable in a crowd of many, but through this woman we can see that her identity is not irreversibly gone. We see that the features of the woman are still present just below the surface of the black paint. The outlines of her eyes, her lips, and nose are still visible. She, like all of us, still possesses her individuality and uniqueness, but she first needs to open her eyes, cast her guise aside, and embrace it. What do you think of this painting? She, like all of us, still possesses her individuality and uniqueness, but she first needs to open her eyes, cast her guise aside, and embrace it. I can definitely see the loss of identity here and the use of “cold” colors to convey a sense of isolation and barrenness.